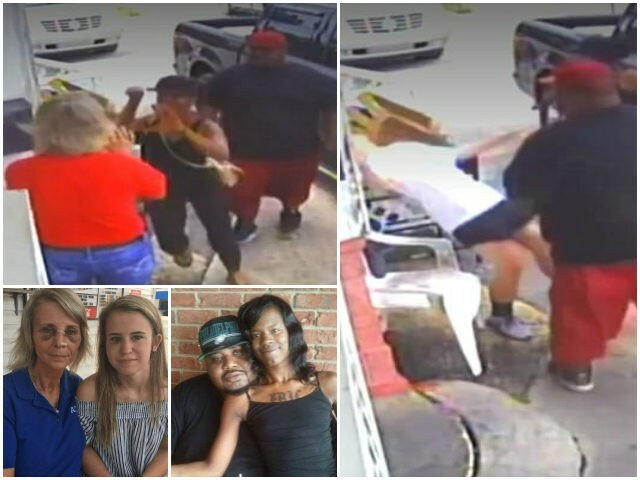 Police are looking for two suspects after video footage emerged of a couple brutally attacking a restaurant owner and her 15-year-old daughter because they were not happy with their order. The incident took place at the Qwik Chick takeout stand adjacent to U.S. Highway 1 in Baxley, Georgia, on Thursday after the couple’s chicken allegedly arrived cold and they were not given enough fries. Restaurant owner Jeanette Norris agreed to give them a refund, although the couple continued to go “berserk” and began slamming on the shop’s windows. “She went berserk. They both lost it, him and her both; started cussing and beating on the window,” Jeanette said. Then, as Jeanette went outside to inform the couple she was calling the police, the female ran up to her and started viciously beating her. Jeanette’s daughter then exited her car to help her mother. However, the male suspect punched her in the face, making her reel backward. “One of my employees yelled, ‘He’s got her,’ and that’s when I realized he had hit her. Who does that? Who punches a child like she’s a grown man standing there? He needs putting in jail,” Jeanette said of the incident. Both mother and daughter were injured as a result of the incident. Jeanette was left with a broken nose while her daughter suffered a concussion. Police confirmed that the suspects fled the scene in a cream or silver-colored 2007 Cadillac Escalade with tag number REU8495. However, the victims say they have been touched by the outpouring of support from their local community. “You hear the old saying, ‘people don’t want to get involved.’ They got involved,” Godfrey told WTOC. “Between Facebook, social media, and you guys at WTOC, it has been amazing the response we have gotten from people.” Jeanette said.